We recommend that you run this report daily. It will help you determine if you have any revenue that isn't applied, so that you can investigate it and apply it to a fee(s) when possible. Note: If a family makes a prepayment on their account, it will remain unapplied until a user links it to fees posted after the payment was received. Point to Reports and click Paid Fees Summary. Enter a Date or a range of dates. Set Show Detail to Yes. This will show the family names and a breakdown of payments. If any revenue is listed as Unapplied Payments, you'll want to see if it can be linked to a fee. In this example for Date Range 4/1/16 - 4/1/16, the Gordon family has a $75 unapplied payment. Go to the Gordon family and click the Transactions tab to look for green Unpaid Amt fields and pink Date Paid fields. In this example, we see both the $75 unapplied payment (green Unpaid Amt field) and a $75 unpaid fee (pink Date Paid field). The family balance is correct at zero. It is important to note that a family's balance is ALWAYS correct as simply the addition and subtraction of debits (fees) and credits (payments). It is possible, however, to have a zero balance on a family's account with fees still highlighted as unpaid because there will also be an unapplied credit on the account that needs to be linked to the fee. Click Pencil icon on the Payment line to open the Edit Transactions box. In the Re-Apply Payment Transaction box, apply the payment to the correct fee by clicking in the fee line's Apply Amt field. 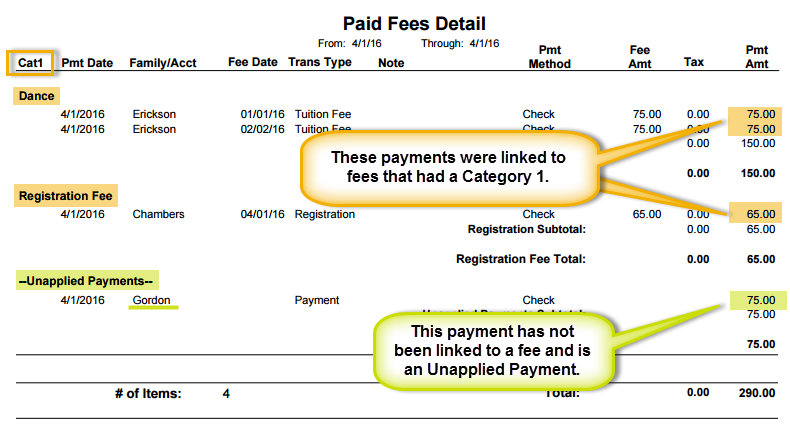 Run the Paid Fees Summary Report again, and the revenue is now properly applied to the Dance category.